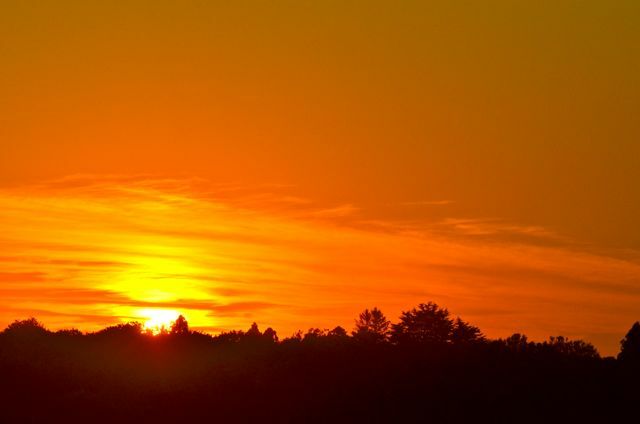 …but the garden has its own version of the sun. Our trip to the east coast is over. We are back in California. The air is warmer and drier. The water colder, but just as wet. And instead of other’s gardens and farms, we get to enjoy our own. It was a great trip, but we are glad to be home. 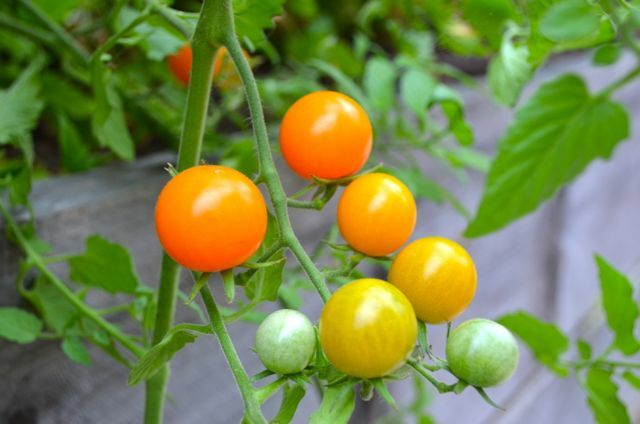 Sungolds, good in just about everything. Gravenstein apples showing their colors. The garden is about where we expected, but the progress always amazes. So much change in just a few weeks. 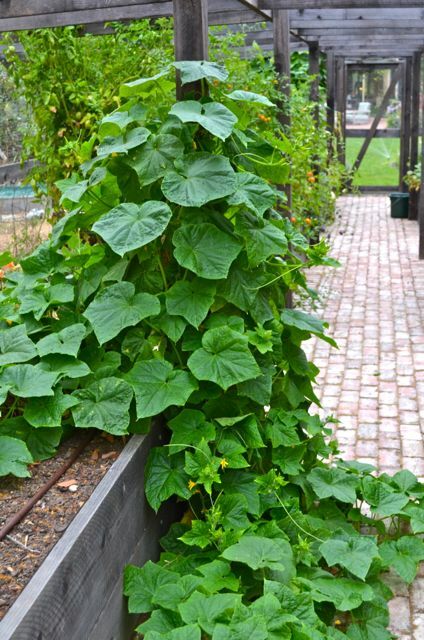 The tomatoes, beans, peppers, cucumbers and eggplant are in full swing. 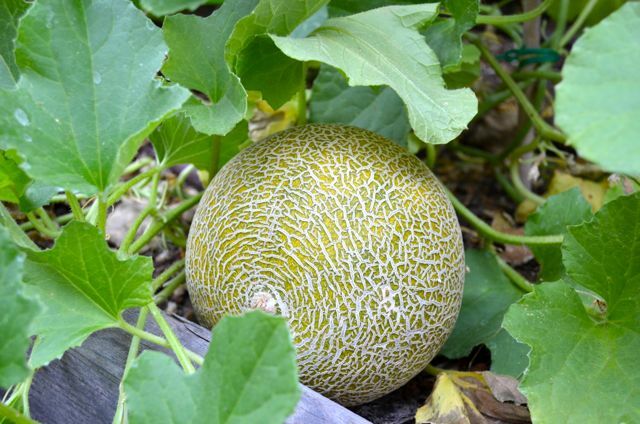 The melons are on the cusp, and we are very excited that we have enough to experiment. The strawberries are in their prime and will produce for a few more months. 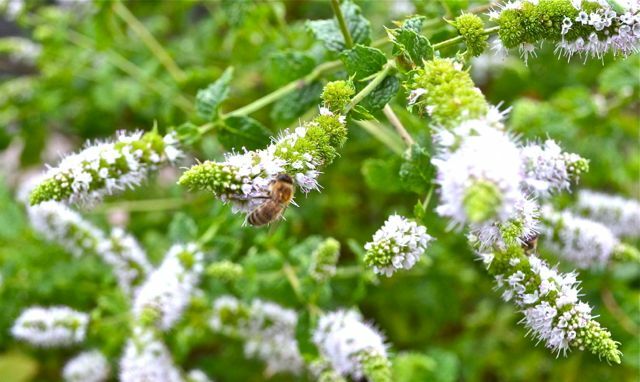 The bees love the mint flowers. We are curious what impact, if any, on the honey. 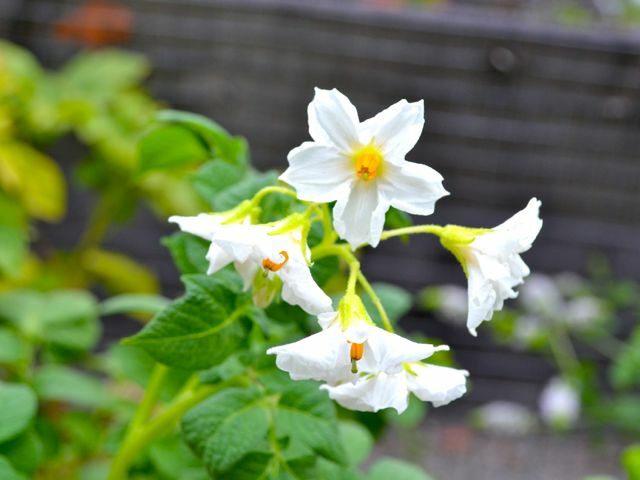 Potato blossom. Another crop coming soon. This is what happens to lettuces when they bolt. Oops. 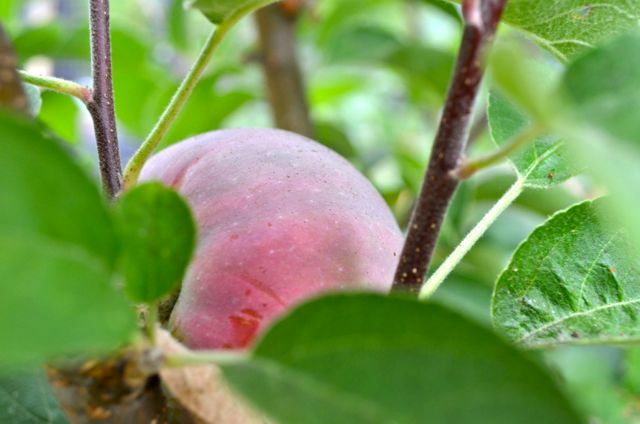 In the orchard, a few peaches are still out there and we will harvest them in a few days. The Comice pears and figs are coming along. 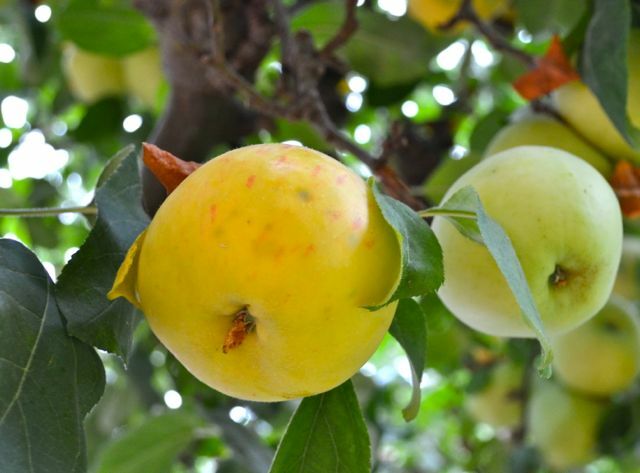 And the Gravenstein and Macintosh apples are ripening. Summer is here, but we do feel fall around the corner. 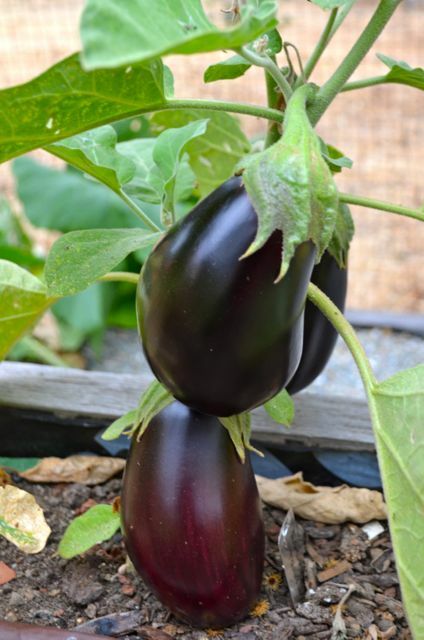 The eggplant are thriving, we know its been hot. A few varieties in this photo. Choices are good. Purple “mystery” tomatoes. Our kids bought them at a garden sale. No idea what they are, but they are pretty and taste good. We do see some signs of our absence. Some fruit went unharvested, greens bolted, and some zucchini went a bit crazy. 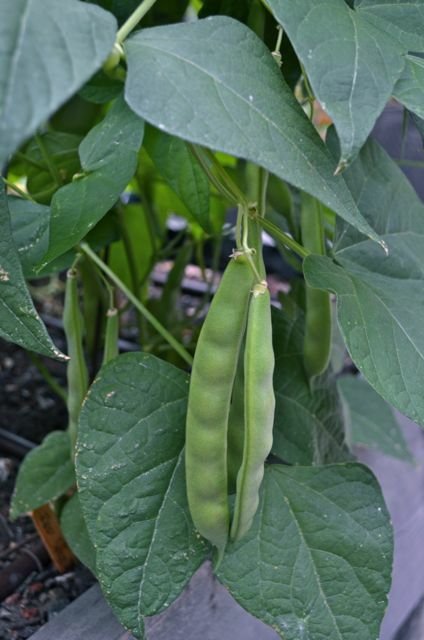 Some of the green beans are so big we are almost afraid to eat them. 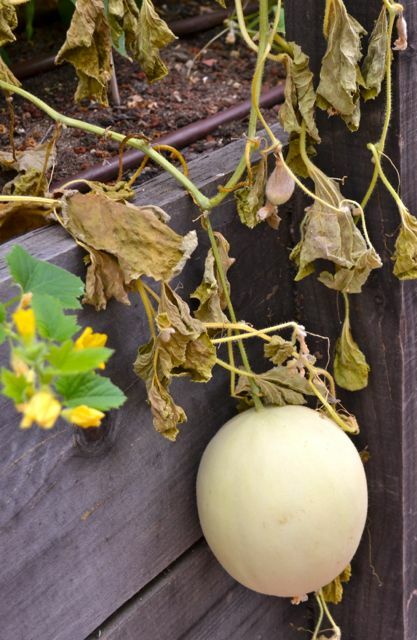 This melon will be ready in a day or two. Very exciting. But for now, summer and smiles reign in the garden and kitchen. And, first and foremost, that means tomatoes. Caprese salads and bruschetta (recipes soon) will rule the kitchen. Eggplant and peppers won’t be far behind. The oven doesn’t see a lot of action this time of year, but we might light up the grill from time-to-time. And we will have friends over and share the bounty of the garden while summer lasts. It is good to be home. Red beans. These are for drying and storing. Our first try with this type of bean. 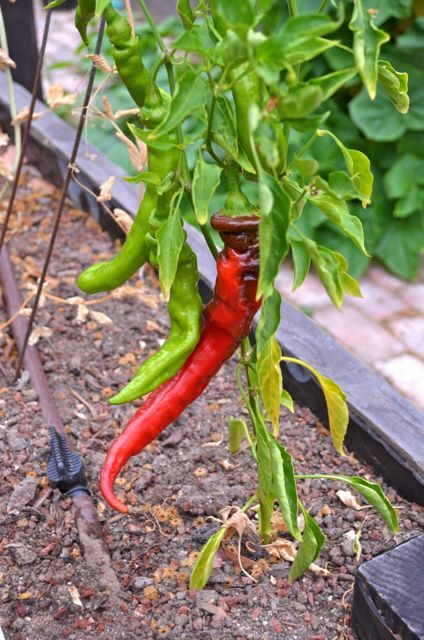 Jimmy Nardello peppers, good red or green. Not sure what we will do with all these Serrano peppers. It’s good to be back. 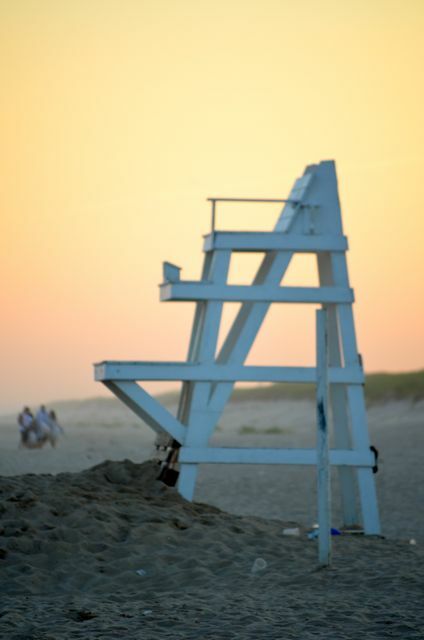 But the beach will always beckon. I love your melon hammock!! Especially after my post today! We enjoyed your post! 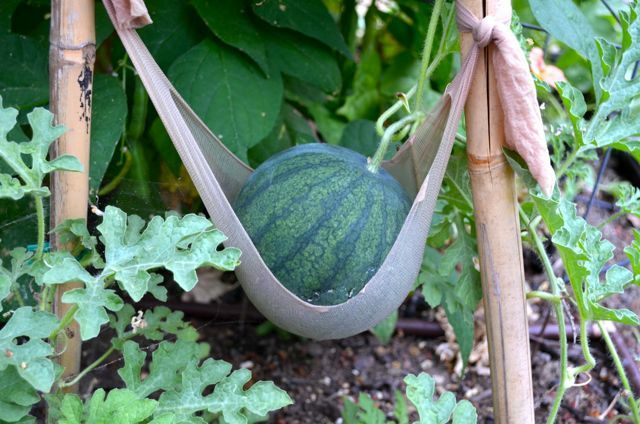 And yes, it is a melon “hammock”…we never tried it until this year- we will see how it goes..
Wouldn’t mind being a melon at your farm – what a fantastic place you have with all this goodness grown on your doorstep – reminds me abut a story about the priest that met a farmer working his fields .. and the priest said – You can thank God for this wonderful and plentiful fields, Yes, I do said the farmer but you should have seen the state of it when he gave it to me. You have a garden of Eden … stunning and with all the goodies all around you. Beautiful tomatoes! Well, and everything else, of course… but mostly the tomatoes! Many thanks! Thanks for visiting us! 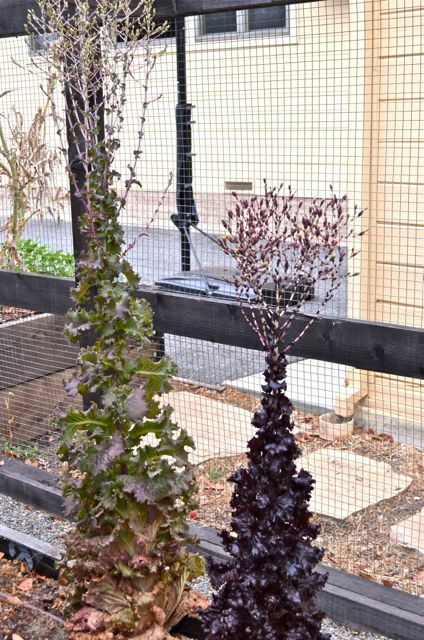 Lovely photos of what looks like a very productive garden! Thanks for sharing! It is always nice to get home again. Purple tomatoes! How neat…I bet they’ll make for some interesting-looking caprese salads. I’ve never heard of bolting greens before. Thanks for the garden tour..it’s fun to see the bounty of other gardens. Thanks- and you will see the purple tomatoes in a post later this week…sort of a ligher plum color inside. BEAUTIFUL. Your crop is putting mine to shame….I am so jealous! Especially of those black tomatoes–I am kind of obsessed with those now! 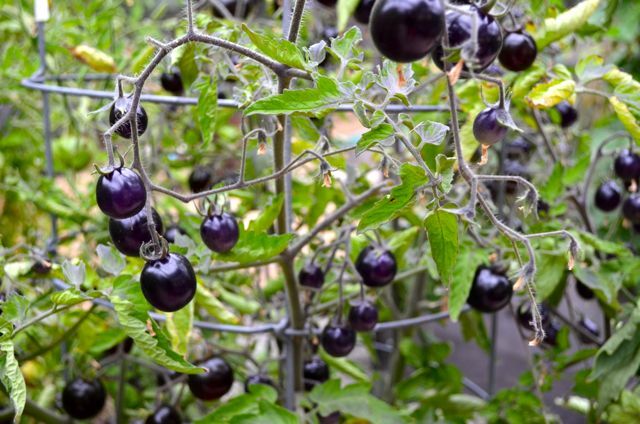 We are learning more about the black / blue / purple tomatoes…they are very tasty. Trying to figure out our variety…we think it is an Indigo Rose, a variety developed by Oregon State University to maximize antioxidants…more to come.. The garden looks amazing but the east end misses you guys! Just kidding. Keep on planting. Keep on posting. Keep on making me feel envy all the time. Thanks! 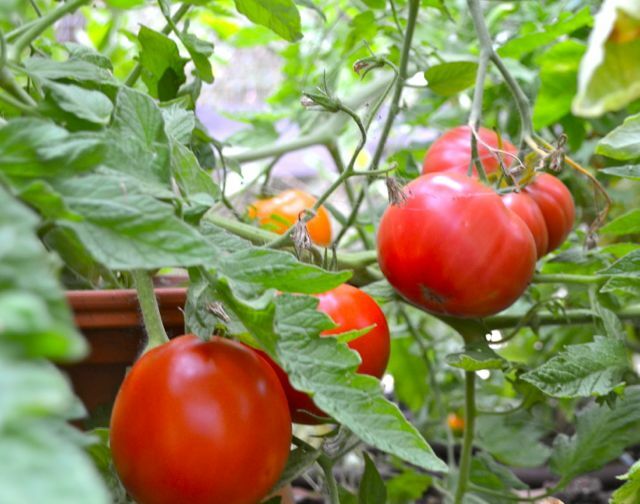 We will certainly keep planting, posting…and eating! Not too bad to come home to all that! Looks amazing as usual! Thanks- always appreciated! Any thoughts on tomato and/or pepper infusions? Happily, we can always start again. What a gorgeous bounty – I’m envious of all the fresh vetetables on your back door step! What a beautiful post, I’ve never seen such giant tomatoes. There is a nip in the morning air that feels like autumn is coming but looks like you’ll have a bountiful harvest. Thanks…usually we get that first taste of fall on the east coast in late august, but we returned early this year…still summer here. The tomatoes look amazing. My terrace tomatoes are not so good this year. Extreme heat and heavy rains, plus a very early season = sub par year. 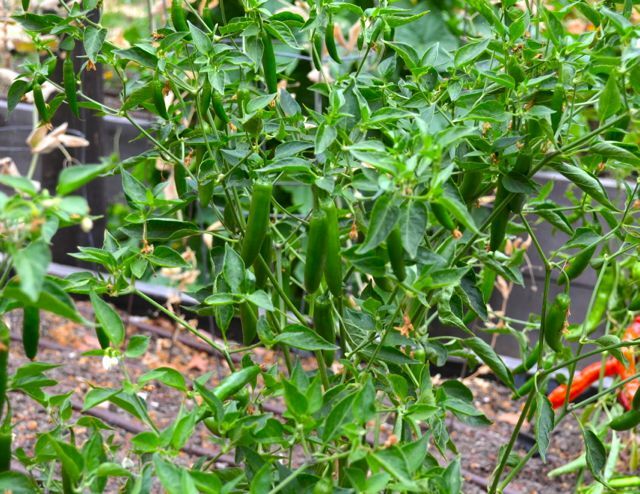 The hot peppers are doing real good tough. Thanks again for keeping in touch with Fried Neck Bones…and Some Home Fries. Nothing makes you appreciate home like a vacation. 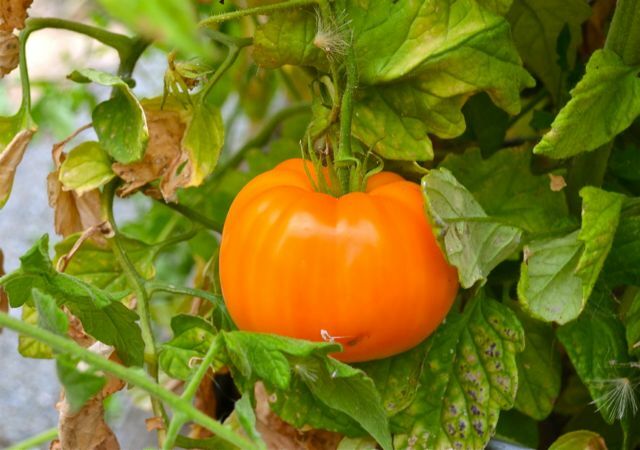 Your garden is beautiful, I love that fat orange tomato! Thanks…and we ate that fat orange tomato- it was good! I’m jealous! Don’t have the space, soil (we live in an area where there just to be toxic industries), and certainly not the climate to grow such stuff! How tasty looking – you’ve made me hungry! Many Thanks- and thanks for visiting us!